This is a great casserole. 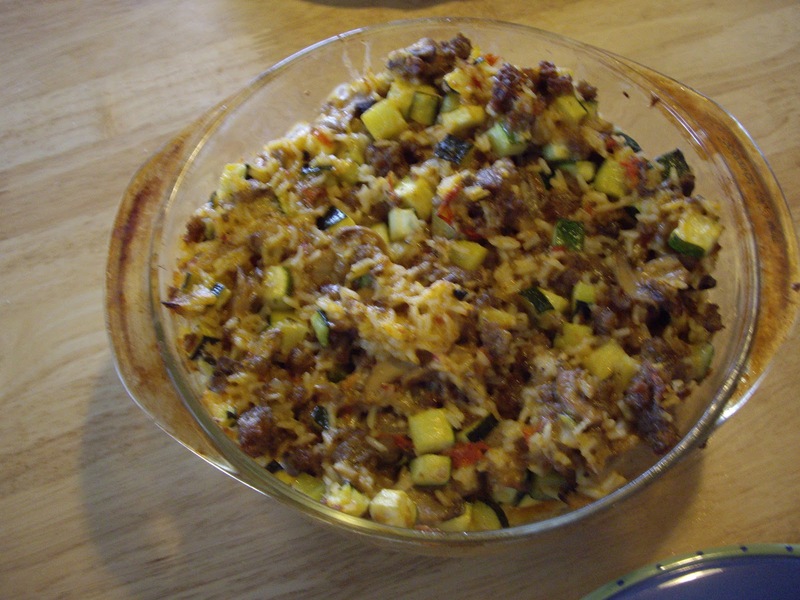 It’s full of yummy zucchini and fresh tomato. I don’t know about you, but I can never find enough ways to use zucchini. Preheat your oven to 325 degrees Fahrenheit/165 Celsius. You will need a 2 quart casserole dish. In a medium saucepan, add the rice and water. Cover and cook 15 minutes OR until water is absorbed. Take off heat, take off lid, and set aside. While the rice is cooking, cook the sausage and onion in a skillet. When the sausage is brown, drain. Stir in the zucchini and tomato. Cook about 5 minutes until tender. Stir in the rice, mushrooms and cheese. Sprinkle with the salt, pepper, and oregano. Bake for an hour or until it is bubbly. If you would rather use brown rice, follow package directions for making 1-1/2 cups. knew you would come up with a great one for the end–i have enjoyed all of your yummy posts! This recipe makes me look forward to zucchini harvest season, something that I typically dread – too many zucchini all at once! Can't wait to try it. So happy to have found your blog while on this A-Z challenge. Zucchini is a wonderful z-word! Did you post recipes for the challenge? Great idea. Congratulations for completing it! Hi, Hallie. I hope you enjoy it. Thank you! Congratulations to you too. Great way to wrap up the A to Z Challenge.